35 posts categorized "Word-Image Combo"
On her blog indexed, Jessica Hagy continually devises new ways to illustrate, via simple graphs, all sorts of complex social dynamics. She calls this above image "Lock the library." I thought: Yes, lock it to protect the books from those who want to censor the ideas they hold. 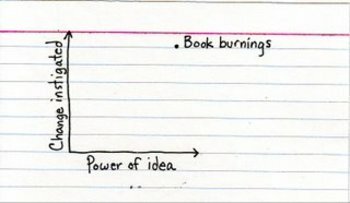 Then I realized how many others want to lock the library to protect others from being exposed to ideas inside the books. This year's Banned Books Week, sponsored annually by the ALA, takes place September 29-October 6. 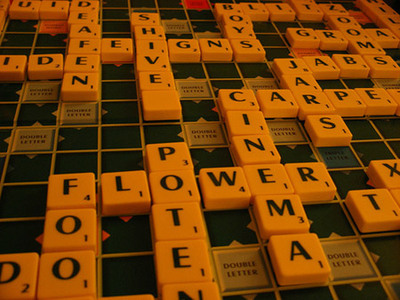 You may be surprised at what the ten most-challenged books for 2006 are. ° It's Banned Books Week! ° Banned Books are big-buzz blogworthy! Update: Jessica Hagy has a chapter in "The Age of Conversation". Read more about it here. Read the titles of the above books in sequence from top to bottom. What happened to The Bathers on A Day at the Beach? Nina Katchadourian started her Sorted Books project in 1993 and has photographed more than 130 separate book clusters since then. The project has taken place in many different places over the years, ranging form private homes to specialized public book collections. The process is the same in every case: culling through a collection of books, pulling particular titles, and eventually grouping the books into clusters so that the titles can be read in sequence, from top to bottom...Taken as a whole, the clusters from each sorting aim to examine that particular library's focus, idiosyncrasies, and inconsistencies — a cross-section of that library's holdings. Her book groupings tell their own stories and also much about the books' owners. Shark is a New York-based journal of poetry and art. The editors publish it from "a home office lined wall-to-wall with books." My bookcases need some rearranging. To remove all books from their usual spaces and re-shelve them according to new narratives would make finding one an entirely new challenge. With this added visual dimension, we felt closer to the music and the musicians; if the video also featured the band in it, and the lead singer sang right into the camera, many impressionable teens could believe that the band played just for them. These virtual mini rock concerts cemented our love for our favorite songs and singers; even decades later, I can't hear many tunes without also recalling snippets from the accompanying video. Billy Collins, former U.S. poet laureate, has a series of animations for his poems. They are poetry videos, and when we view them, we understand his poetry in a new way. We see Collins' and his animators' shared visions for his words. He calls his poetry videos "action poems." Which poems would you like to see videos for? Or do you prefer to keep your own images and interpretations of the poems your primary visuals? When was the last time you wrote a poem? If you use Twitter, you might be a poet, and you don't even know it. With Twitter, the public messaging service which limits responses to its question "What are you doing?" to 140 characters, found poems, mostly unintentional, bob in its sea of second-by-second updates. Structure defines different types of poetry. Sonnets have fourteen lines, and villanelles have nineteen, each with different rhyme schemes. Haiku have three lines, each following a 5-7-5 syllable pattern. After looking in a book of haiku and counting characters (including spaces between words) in a few, I've found that haiku can fit in the Twitter 140-characters format. More poetic musings exists in Twitterland. - How am I ever going to learn to write if you won't let me take the pen? 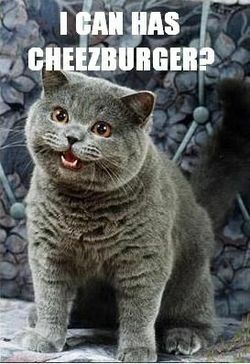 - Does this whole thing make me Cat 2.0? - I'd kill for a Nobel Peace Prize. - I'm addicted to placebos. I could quit but it wouldn't matter. - In school they told me "practice makes perfect." Then they told me "nobody's perfect." So then I stopped practicing. It takes practice and skill to write something memorable and brief. A thought has to be completely distilled to make an impact or it's ignored. Fluff blows away on the digital breeze; the diamonds stay. As I Twitter, I'll continue to grind my one-liners, and I'll soon throw in a haiku. After discounting Twitter as one more needless distraction in my media-saturated life, I've come to see its usefulness as an occasional, community-based writing exercise. Though poets often write about the small moments of everyday life, I'm still not convinced that anyone needs to know that I just took my laundry out of the dryer (one of my first silly "tweets"). I do like the idea of sharing wit and poetry with others, however. My Twitter address is here, if you're interested. Apparently, there are still a few topics that blogging hasn't touched — until now. 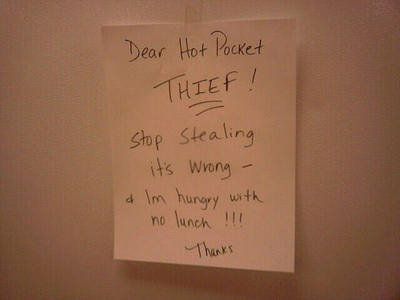 Behold new blog passive-aggressive notes from roommates, neighbors, coworkers and strangers. If you're a grammar nerd like me, you'll cringe as you read these. Then you'll laugh, because some of these notes are hilarious. Ever received a passive-aggressive note and still have it? This blog takes submissions. I wonder — will people start faking these notes just to get featured on this blog? 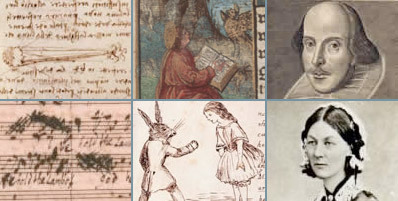 Turning the Pages™, the British Library's online rare books and manuscripts gallery, is an inspiration. It reveals some of the most influential texts in world history. When I stumbled across the site, I felt like I'd found treasure, now open for all to see. It is also one the most comprehensive, beautifully done and easy-to-use multi-media set-ups I've seen online. • Leonardo da Vinci's personal notebook — It's breathtaking to see his scribbles. • The oldest printed "book" — the Diamond Sutra printed in China in 868. You actually turn the scroll to see the entire work. • Mozart's musical diary — This also includes 75 audio excerpts. 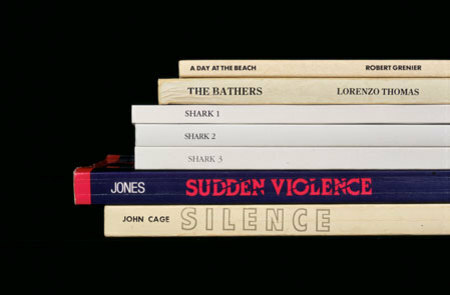 There are many additional books featured on the site, and too many great works to list them all. The British Library has made it fun to look at these books. All items can be magnified; to do so, click the magnify button and drag a large, flat virtual magnifying glass across the map or text. Click the audio button to hear more facts about the notebook, or simply read the text by clicking the text button. The help button is nearby, but the site is so effortless to use, it doesn't seem it will get much attention. For a quick, wondrous peek, take the online highlights tour. Experts' articles on the works are part of the features section. Block out some free time, and enjoy.